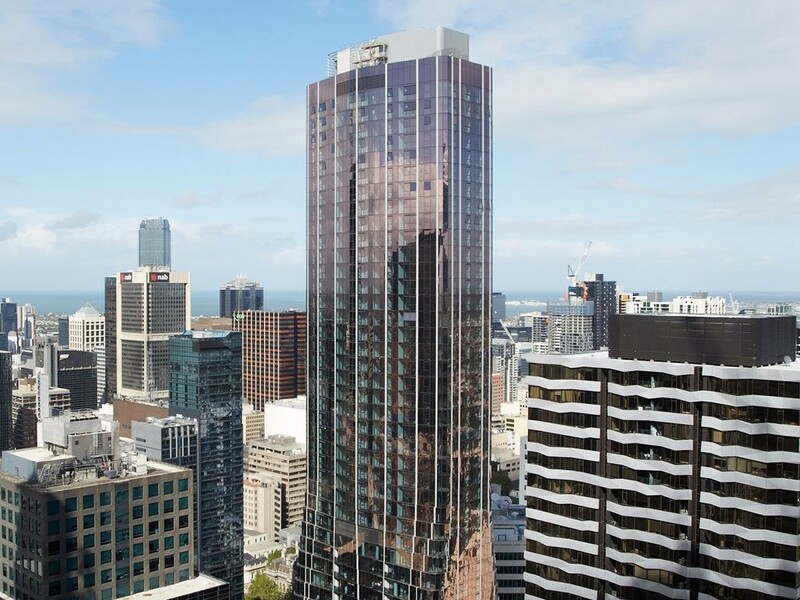 Multiplex has completed the construction of a 63-storey residential building in Melbourne’s CBD. Designed by Elenberg Fraser, Eq. Tower is located at 127-141 A'Beckett Street and features a curtain wall glass façade. The partial brainchild of Elenberg’s new design direction, Igor Kebel, the glittering design was intended as a “dramatic shift in the Elenberg Fraser design process”. “[Eq. Tower] is dedicated to Igor’s love affair with the New World,” says Elenberg Fraser in a design statement. “The project is a teaser for Melbourne’s urban future – this city has the potential to be a glittering star in the galaxy of South-East Asian cities. For the project, Elenberg Fraser departed from their previous design protocols and employed a parametric process. Essentially, this means that Eq. was designed using the parameters of a scripting process, with a series of small routines covering the main criteria: view lines/aspect, amenity/daylighting and interaction with wind frequency and oscillation. “The programs are run to resolve the design. Which is tested in Ecotect software then further adapted by the team,” says Elenberg Fraser. In summary, this new, parametric process allowed for the design of the tower to better reflect its context, and to respond to the site’s unique physical requirements. For the façade curtain wall, analysis of weather patterns, sunlight, views and apartment usage was undertaken to ensure no space was underutilised and natural light could be delivered to all living and bedroom spaces. Another result of the parametric process was a seamless integration between balconies and wintergardens, which Elenberg Fraser says is needed for anything above 24 storeys for the comfort of residents. These ‘external’ spaces are enclosed, while gill-like structures allow for ongoing interaction with the elements. Glass for the façade was sourced for its high levels of performance. The panels are composed of low-emissivity glass finished with a directional oxide coating. This means that the building is constantly interacting with the sun, undergoing a constant transformation with changes in the light and colour of the sky. To achieve a rose tint for the façade – reminiscent of Hong Kong’s towers and in-line with Kebel’s vision of a New World structure – an LED lighting device was set into the grooves of the building’s surface. Internally, sustainability features included installation of a centralised, VRV air-conditioning system that enabled all condenser units to be removed from balconies. Eq. Tower’s design also involved a range of ESD features such as photovoltaic solar panels, rainwater harvesting and re-use, water-efficient fixtures and appliances, and high-performance double glazing throughout.